This is possibly 8 excellent marketing Ad campaigns we have compiled which display out of the box creativity! With all the great campaigns that were made in the last three years, this is a personal favourite and has Top of the Mind (TOM) recall. The advertisement was launched during ICC World Cup 2015 weeks before India v/s Pakistan match. Over the years the team members at Perfetti Van Melle have improved the brand identity of Center Fresh as a youth brand. Center Fresh was started in India in 1996, and throughout the years, it has maintained the freshness aspect of its communication. In 2011, this ad was aired for the first time and got an immediate hit with youngsters. The label gained useful insights about increasing viewership on YouTube and used it to launch its digital marketing campaign. With this ad campaign, Nestle touched its desired levels on the Buzz meter. The ad describes the story of a stammering standup comedian. The ad very nicely showcases two things in the ad, the passion of the artist and the kicks from the coffee. Nestle first introduced this ad campaign on Twitter and YouTube exclusively for its followers. A careful examination of these Ad campaigns provides a beautiful opportunity for us to understand the nuances of what makes one brand have better recall value than others. With the growth of social media and a frequently visual audience, it pays to keep in memory the success mantras of cross-platform marketing campaigns that have managed to create a space in the minds of consumers. When creativity is regarded, you can’t ask for more. They know their audience. They know what would make them use their service. They always result to turn the foodie-self on on you. Oreo India has happily cracked the code to keep their audience engaged with their content. The challenges were higher, as when they entered the Indian market, it was already overshadowed by prominent brands like Britannia and Parle. So, they started with a brand recognition campaign with #DailyDunks with Bollywood’s heartthrob Ranbir Kapoor. 9 out of 10 known brands will shy out if you ask them to take an opinion on a social issue. 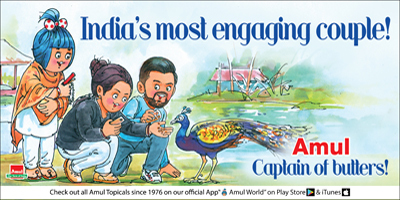 But Amul, famous for their topical stories, is definitely an exception. Be it any cause or matter, Amul is always there with its opinionated version. Imperial Blue is a well-known name among whisky lovers. But the brand got the ultimate fame from its “Men will be men” campaign. The campaign is based on video marketing which got a super response all time. Last year in December, Samsung launched 4 minutes long advertisement which was so heart-melting and memorable. It was based on #SamsungService. Conclusion: Some common factors in all the brands mentioned above’ content marketing. 1. Creativity is the most-wanted factor these days. 2. Less is more, as long as you are delivering high-quality content. 3. Content creation according to the network and its audience. 4. Video marketing and humour marketing is the future. 5. No use of automated posts, when it comes to managing multiple network systems. 6. Celebrity association for creating instant buzz.